DOS Alien Carnage (freeware) in 20:31.67 by Ilari. Formerly known as Halloween Harry, Alien Carnage follows our hero Harry as he single-handedly fights off an invasion of aliens intent on zombifying the populace while rescuing a large number of hostages they have taken. It is fast-paced at the general expense of control quality. The original creators, John Passfield and Apogee Software, generously released the game as freeware in 2007 and it can be downloaded from here. 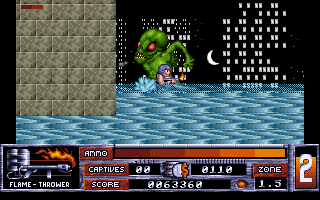 This run by Ilari plays through all four "missions" (episodes) back-to-back, as playing through the first three missions is required to unlock the fourth.